The immune cells that are located in the tissues, which are known as tissue histocytes and their supportive cells. The immune cells that are located in the blood stream, which are known as white blood cells. Antigens are foreign cells that attack the human body, including bacteria, viruses, fungi and parasites. Basically, they are the toxic "enemies" of our bodies. 1. 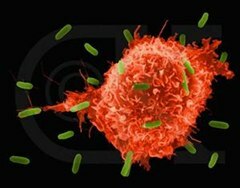 Macrophages - They are the main infantry units of the immune system. They kill the foreign antigen by eating and digesting them in a process known as phagocytosis. Their primary function is to fight until external support comes from the white blood cells. 2. Dendritic cells - They act like intelligence units that gather information about the attacking enemy (antigen), and the send this information to the central command of the immune system. 1. Neutrophils - These cells are best described as the armored units of the immune system. They are quite similar to tissue macrophages, but with much better function and performance. Their main function is to fight bacteria, especially pyogenic ones (which form puss during infection). Thus, doctors usually know that the patient has a pyogenic infection when the level of these cells in the blood has risen above 7000 cell/mm3 (a condition known as Neutrophilia). 2. 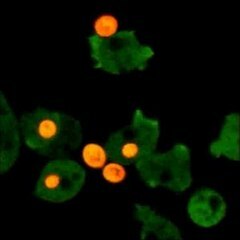 Eosinophils - These cells are best described as logistical units, which are responsible for carrying ammunitions and supply to the fighting immune cells. They're secret chemical substances known as cytokines and interleukins that make the blood vessels at the site of infection more wider, so as to bring more blood supply to the infected tissue. These cytokines are also attracted to the white blood cells in a phenomenon known as chemotaxis (chemical attraction). Chemotaxis means the attraction of WBCs to a site of infection by cytokines and interleukins. When the eosinophils turn crazy, they start to secrete endless cytokines, inducing attraction of the WBCs to normal body cells, leading to what's known as autoimmune disease. Some examples are systemic lupus erythematosus and rheumatoid arthritis. Autoimmune diseases are due to abnormal function of the immune system. The immune system starts to attack the normal body tissue. The eosinophils are responsible for reporting abnormal behavior. Eosinophilia is a medical term where the number of these cells in the blood are raised above normal limits. 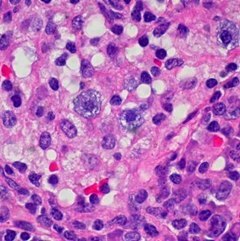 Eosinophilia is a characteristic finding in patients with autoimmune disease, e.g. rheumatoid arthritis. Eosinophilia leads to inflammatory response, including redness, hotness, edema and pain. 3. CD8 T-Lymphocytes - These cells are best described as the special forces unit of the immune system. Their primary function is to attack viruses, TB and some types of fungi. They kill their enemies by injecting lethal substances into them, forcing their DNA to breakdown in a phenomenon known as cell-mediated cytotoxicity. 4. Helper T-Lymphocytes: These cells are best described as central command of the army. 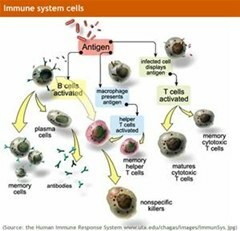 T helper cells (or Th cells) are the secret various types of chemicals that regulate the function of the immune system in fighting back against the attacking enemies (antigens). Many immunologists consider T helpers as the maestro of the immune system. 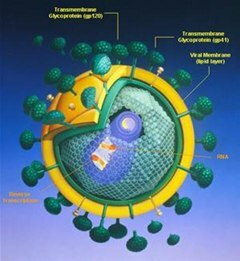 HIV attacks these cells. It destroys them, leaving the immune system without central command, leading to failure of the immune system to fight back against the attacking enemies (antigens). This make the patient infected with the HIV virus with weak immune resistance and higher incidence to infections. 5. There are other types of immune cells (e.g. monocytes and basophils), but they are less important than the previous ones. The process through which the immune system attack foreign antigens is known as inflammation. In the next article, we will learn how the immune system makes the process of inflammation and how physicians support that process in a manner that harms the antigens, but protect the patient. News: the fight for a better system. How To: Deal with a Stiff, Achy Back? How To: Know if Osteoarthritis Is More Common in Females Than in Males?